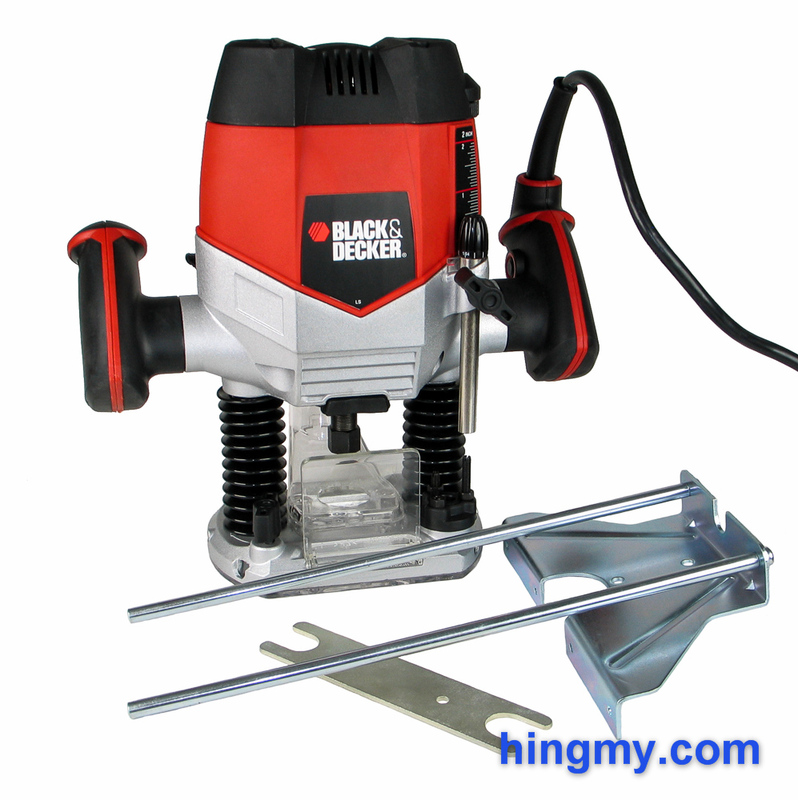 Sticking with our principle of reviewing tools that people actually used, we took a look at the Black&Decker RP250 plunge router this week. This entry level router looks like a full-featured router, but cost a lot less than the competition. A lot of novices will find themselves looking at the RP250 wondering if it is a good first router for woodworking. Always wanting to warn our readers about potential lemons, we decided to review the RP250 for you. Lets take a look what the B&D RP250 can and cannot do, and if it is worth your money. The B&D RP250 is an entry level plunge router. Being sold in department stores it is one of the most popular routers around. B&D promises a tool that performs like a full priced router. Off course the company had to cut a few corners to get there. The motor of the RP250 is weaker than average, but still capable of driving the bits that can be installed in this router. The variable speed selector adds a level of sophistication that is surprising at this price point. The missing soft start aside, the RP250 has everything it needs to produce quality work. Not stopping there B&D has kept the quality of the tool up in most places. The base plate, support columns, and main body of the router are all made of metal. There is no doubt in our minds that the RP250 will keep its alignment for years. The only plastic to be found is in the handles and the motor cover. The RP250 may not be industrial grade, but it will last for a fair amount of time in a low throughput shop. One of the most significant drawbacks of the RP250 is the sized of the opening in the base plate. At a little over ~1 inch in diameter the oddly shaped opening limits the maximum size of a bit that can be installed in this router. Since the walls of the opening are made of metal there is no way to install a larger sub base in the router. This dynamic effectively limits the router to smaller size bits. The maximum size round over bit that fits into this router, for example, is probably a 1/2" diameter bit. The collet options match the small size opening. The RP250 comes pre-installed with a 1/4" collet which cannot be replaced with a larger one. This is not really a problem given the expectation that this router will only be used with small router bits. Due to the odd shape of the base plate, guide bushing simply cannot be installed in this router. If you plan on doing inlay or pattern work, the RP250 is not the tool for you. The hand grips of the RP250 are oddly shaped for a plunge router. They are smaller than average and have a very pronounced lip at the top. Users will smaller hands will find them very comfortable; average sized handswill find them odd. The trigger of the RP250 is well positioned on the right handle. It is easy to engage and release. The trigger lock is located on the side of the same handle. It is activated with the thumb of the right hand. When engaged it is very hard to accidentally disengage the lock. The button is inset to stay out of the way. The RP250 managed to thrill us with its smooth plunge action. The spring resistance is almost uniform from the start of the plunge to its lowest point. Two springs, one on each column, are to thank for that. Unfortunately the springs are installed on the outside of the columns. Each is protected by a flimsy plastic boot that keeps the dust out, but does little to improve the look of the router. The spring covers are easily the worst part of the RP250. The plunge range is excellent. At full plunge the collet touches the work piece giving the router well over 2 inches of plunge depth. The plunge lock lever is located in the same place it is found on other plunge routers, but it shows some poor design decisions. First off the lever is not spring loaded. The operator must pull on it to lock the router, and push it in the other direction to unlock the router again. This could be excused, if the lever was within easy reach of the operator's left hand. The RP250's lever is so far off that the operator has to reposition his hand on the grip to operate the lever. The system is still workable, but it is noticeable harder to use than it is on other plunge routers. The depth stop continues the parade of poor design decisions. At rest the depth rod is a full 1 inch above the highest stop on the turret below. The router has to plunge a full inch before the stop has a change to engage. The rod is simply too short to cover the entire plunge range of the router. In practice this will be less of a problem than it seems at first , because most bits are too short to use the full plunge range of the router. Most of the time the router will have to plunge the first inch through air for the bit to each the work piece. If you look carefully, however, few of the other routers in the market have this problem. The scale at the top of the router inherits the range issue from the plunge rod. The rod is too short to fully utilize the scale throughout the full plunge range. When the router is within the correct plunge range the scale reads accurately down to 1/16". Fine adjustments down to 1/64" can be made with a thumb screw at the top of the plunge rod. 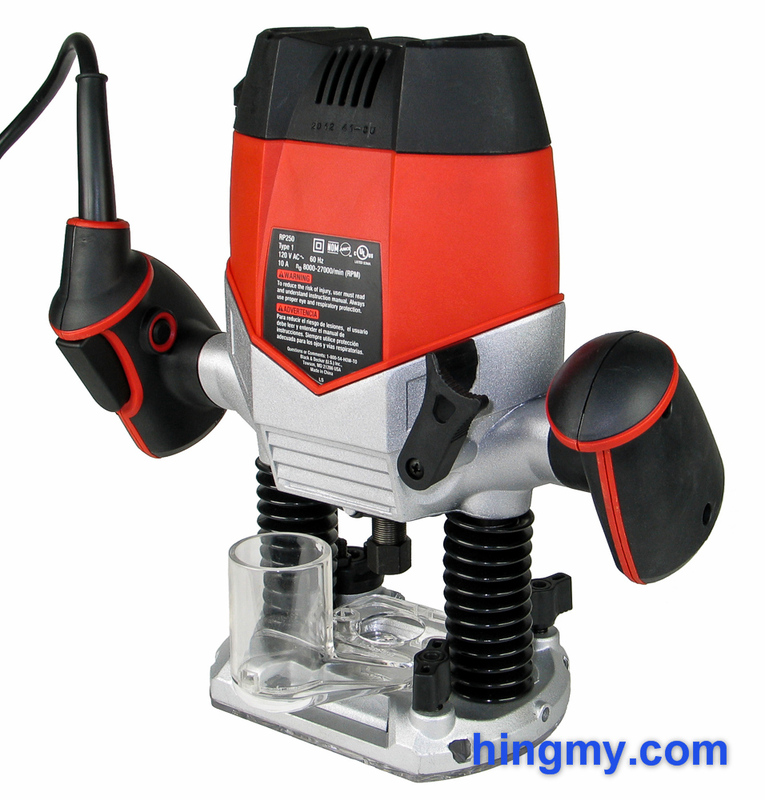 The turret built into the base of the router has 3 positions, two of which are adjustable. The turret is easy to turn and locks into position with authority. The rods protruding from the turret have sharp corners, which will scratch anything they come into contact with. Overall the depth stop mechanism works well within the normal plunge range of the router. At the extremes of the range it cannot be used. The mechanism can be fixed by replacing the rod with a dowel rod that is long enough to reach the depth stop. But honestly, who wants to do that on a router you just paid good money for. The RP250 comes with a pre-installed dust shroud that covers the bit above the table. The shroud is made from clear plastic and funnels all dust to a built-in dust port. With a vacuum attached the RP250 does a marvelous job of collecting dust above the bit. The tight chamber the bit rotates in makes for excellent dust collection. The router even picks up a good amount of the dust produced below the table. Without the shroud installed the router ejects dust in all directions. 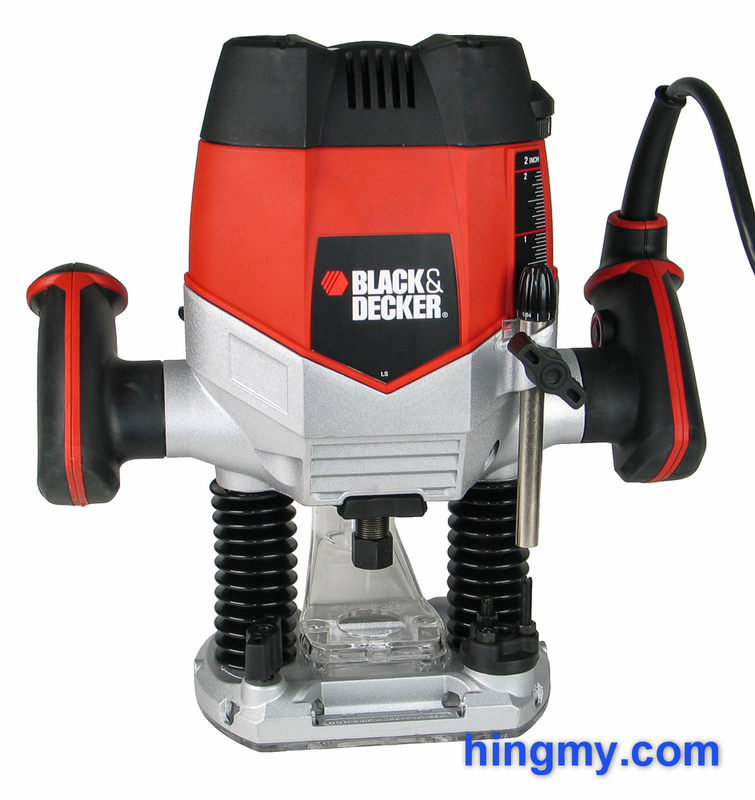 Black&Decker included a clear plastic dust shield that prevents dust from flying directly at the operator. Our guess is that this feature caters to uneducated user who have not learned to wear safety glasses. Since the shield does obscure the bit a little, most accomplished woodworkers will quickly remove it. The RP250 comes with an edge guide. The guide is a bit crude, but well made. It installs on the router in a few seconds. In use the guide does its job. Cuts parallel to the edge of a work piece can be accurately and reliably made with this guide. The true value of this guide becomes apparent when examining the price of this router kit. You get the RP250 and an edge guide for the price of half a router. The edge guide might be a little crude, but its fully functional. More money buys you better implementations, but the RP250 kit can be made to work with enough patience. The RP250's story is not one of failure. but one of usage range. If you can fit the bit into the router and make the plunge mechanism work, the RP250 performs just like any plunge router. The excellent feel of the plunge mechanism makes you forget that you are holding a budget router. 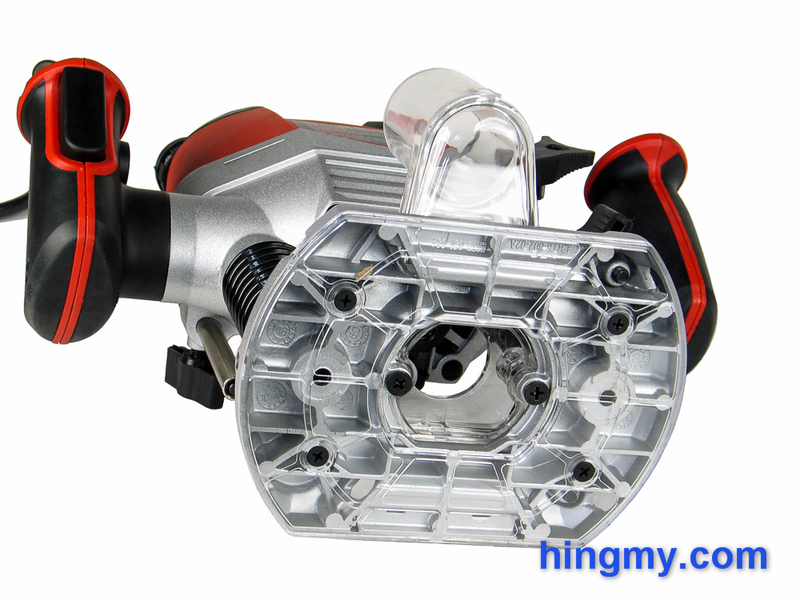 The motor is plenty powerful to drive any bit you can hope to install in the tight base. If it fits, the RP250 can power it through anything. When you go beyond what the RP250 can do, the router simply does not show up to play. Large bits cannot be installed, largecollets cannot be mounted, and the usable plunge range is limited. If you depend on your RP250 to complete this work for you, the tool is a failure. If you understand these limitations and use the RP250 for what it is made for, you will find a trusted tool in your RP250. The RP250 is clearly an entry level tool. 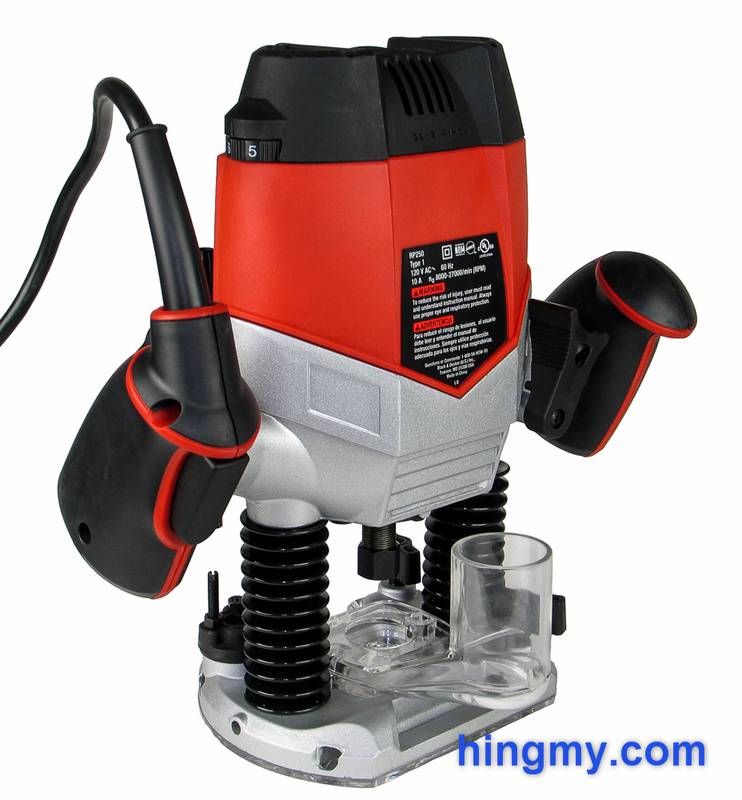 It cannot complete the full range of tasks a plunge router is expected to perform. This router has no place in a commercial environment. The small opening in the base plate and 1/4" collet limit the router to small bits. When used with one of these bits, however, the RP250 performs just like a full-featured plunge router. It won't last as long and there are a few quirks to contend with, but the RP250 gets the job done. A sturdy frame and reliable plunge action ensure that. The B&D RP250 is a solid plunge router and an ok option as a first router. You will eventually outgrow this router, but until this happens the RP250 will not hold you back. If you understand the limitations inherent in the RP250's design, thisrouter can be a good buy for you. For everyone else there are better routers out there.